How many times have you been asked if you know someone that can do this or do that? You can fill in the blanks, but the point is that employers often fill job openings with people that they know and trust. Or, they get referrals from someone else that they know or trust. If you’re looking for a job, make yourself marketable and inform people that you are looking for work. Don’t get me wrong, you should never discount the effectiveness of employment agencies, headhunters and staffing agencies, but there is no better resource for you to find employment than yourself. I remember when I was unemployed, and I didn’t want anyone to know because of my pride. I figured that people would see me as a failure if they knew I was unemployed. It took me months of suffering to overcome my pride/ego and finally reach out for help. I recognized that unemployment is a fact of life and at some point or another we have all been unemployed. Once I informed people that I was looking for work and had others aid me in my job search, I started to get the type of assistance I needed. Great job referrals started to come my way, and I had more options and started to feel better about the employment market. My friends, family and ex coworkers advocated for me, and I received several job offers from employers. I found employment only a month after I began to let my network know I was looking for full-time employment. For many months before that I had been using all types of employment services. I was applying online with different companies, and I was met with no success. I found that the most effective marketing tool at my hand was “myself” and my network. My mother used to tell me that “a closed mouth won’t get fed,” which means if you don’t speak up for yourself, you may not get opportunities that could be available. Since the majority of jobs aren’t advertised, it is a fair statement that most jobs are given to those who are connected to a network. Tune in for tomorrow’s blog that will share the importance of building lasting relationships in your networking efforts. Cornelius Booker is a senior member of the Regional Navigator team and a graduate of Oklahoma State University where he received his Bachelors in Marketing and later received his M.B.A with a focus on Business Marketing and Management. 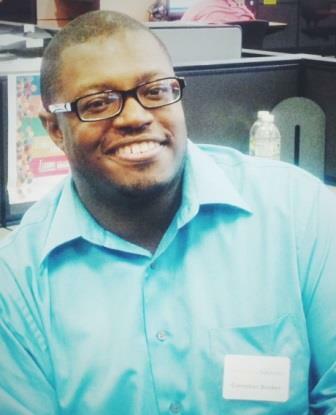 With his personal experience and passion for the disabled community, Cornelius’ insights are an invaluable asset to the Workforce Solutions organization.